Unlocks the Zone, Gear, Membership, and ACs! We're excited to introduce the BoneBreaker adventure package expansion tomorrow, December 11th! 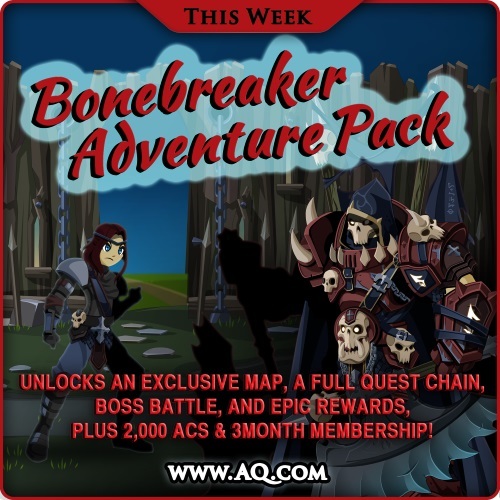 When you purchase the adventure package, you'll immediately unlock the BoneBreaker armor and 4 helms in your Book of Lore, plus the Bonebreaker Fortress Map item which will grant you access to the exclusive battle zone in DeadMaw Woods! Unlock the adventure and reap the rewards! Legends with active memberships can also access the zone, quests, merge shop, and monster drops, but will not unlock the exclusive shop, gear, or quests. How to Unlock the BoneBreaker Package? Talk to Shara Kinrunner in /bonebreak to begin the adventure!